So we’ve talked about various components in an EPA before (e.g. lab coats, bags, tape and so on). But there is one important part we have not covered yet: ESD protective working surfaces. So let’s change that right now! ESD protective working surfaces aid in the prevention of damage to ESD sensitive items (ESDS) and assemblies from electrostatic discharge. ESD working surfaces, such as mats, are typically an integral part of the ESD workstation, particularly in areas where hand assembly occurs. The purpose of the ESD working surface is two-fold. When deciding to invest in ESD protective working surface, you have the choice of ESD matting (laid-out on a standard non-ESD bench) or ESD benches. Performance-wise there is no difference so what option you go for depends solely on your personal preference. Whatever your choice, your ESD protective working surface needs to be grounded. A ground wire from the surface should connect to the common point ground which is connected to ground, preferably equipment ground. For electronics manufacturing a working surface resistance to ground (Rg) of 1 x 104 to less than 1 x 109 ohms is recommended. Best practice is that ground connections use firm fitting connecting devices such as metallic crimps, snaps and banana plugs to connect to designated ground points. The use of alligator clips is not recommended. Operators should ensure that the working surface is organized to perform work and that all unnecessary insulators and personal items are removed. Regular plastics, polystyrene foam drink cups and packaging materials etc. are typically high charging and have no place at an ESD protective workstation. Insulators can be a considerable threat to your products. Remember that an insulator cannot be grounded so it will retain its charge for a long time. Removing all non-essential insulators from the ESD protective workstation is an important rule. If not, your company’s investment in the grounded ESD working surface may be wasted. “The biggest threat is Field Induced Discharges, which can occur even at a properly grounded ESD working surface. If an ESDS is grounded in the presence of an ElectroStatic charge, instead of the ESDS having charges removed from it, the ESDS may become charged with a voltage induced on it. Then, when placed on the grounded ESD work surface, a discharge occurs. If the ESDS is removed from the presence of the ElectroStatic charge and grounded again, a second discharge may occur.“ (Ref. ESD Handbook, ESD TR20.20, section 2.7.5). The ESD working surface must be maintained and should be cleaned with an ESD cleaner. 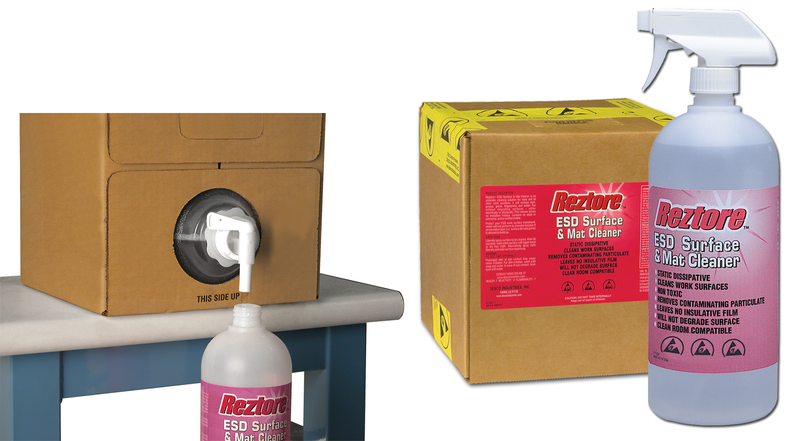 Regular cleaners typically contain silicone and should never be used on an ESD working surface. The ESD control plan should require testing of the resistance to ground periodically. For more information on testing your ESD working surface, check this post. However, the operator should be on guard every day and check visually that the ground wire is attached. Do you use containers to store or transport ESD sensitive items? If so, make sure to read on! We've compiled a list of 3 tips you should follow to make sure your ESD sensitive devices are fully protected.